Download Our New Parish App! 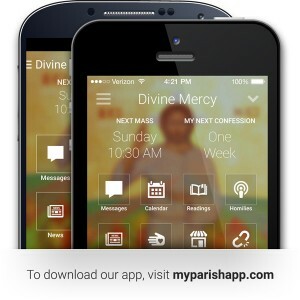 Our new Divine Mercy App is now available to download for iPhone and Android smart phones. Stay connected with our parish throughout the week with instant notifications, an easy-to-access event calendar, and the ability to quickly reply to or share messages via Facebook or Twitter. Also enjoy a bunch of additional features like prayers, daily readings, helpful reminders to silence your phone before Mass or Confession, and much more. Help foster a stronger parish life at Divine Mercy Parish and better engage the New Evangelization. Download our App today at myparishapp.com or search your phone’s App store for myparish.